Inside: Read to find out how to teach your children 5 ways to prevent cyber bullying. Internet use has become increasingly common amongst children of all ages. 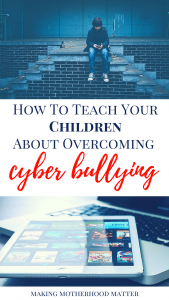 You may think that it may be too early to start counseling your kids on the topic of cyberbullying, but in many cases, it is better to start the conversation earlier rather than later. Your children may start using the internet for skill-building games, but it is common for children to foray onto communication-based sites and applications as early as four or five years old. While instant messaging tools are frequently not used by children until they are nine or older, and become much more important in the adolescent and teenage years, you can start to enforce the rules of conduct on the internet much earlier. These are the top tips for establishing and maintaining safe use of the internet and other communication tools to prevent your younger child from becoming part of either side in a cyber bullying incident. Whenever your child begins to use the internet, it should be presented as a privilege, not a right. Internet use should be monitored and only available with your permission. Instruct your child to consult with you before opening new web pages. As your child gets older, it may become cumbersome to approve every page switch. The idea here is to establish what is acceptable and unacceptable together when they are younger and to eventually allow them to navigate this on their own. You should still monitor search histories periodically and flag any sites that they may have created accounts on. If feasible, you might consider blocking social media sites like Facebook so that your small child is unable to create an account. As your child grows, have open conversations about tools such as Facebook. Your decision to allow them to be on social media will be dependent on your personal feelings, your child’s maturity and understanding of how they can use their accounts, and how much social pressure your child feels based on the number of other children they know on social media. As your child gains more and more access to the internet, be clear about your expectations for online conduct. Make it clear to your child that you expect them to be polite when interacting with others online, just as you would encourage them to do with other individuals in person. Maintain open communication and encourage your child to come forward if they find themselves on the perpetrating side of communication that may lend itself to cyber bullying, and to discuss anything that is directed at them as well. Cyber bullying often occurs when older children have access to information from their peer’s phones or computers, which they can then circulate. You can begin to prevent this sort of occurrence with your child from an early age by making sure that they know that personal computers are private. They should always ask you to use your computer. For family computers, it can be helpful to set up separate user accounts. Cell phones should also be viewed as private. Encourage your children to ask permission before using anyone else’s cell phone. Help them to password protect their devices and instruct them to keep their passwords secret. Interacting with others through the screens of technology, even in video form, has been shown to elicit less empathy between individuals in an online or text message conversation. Encourage your child to view everyone, including their online representations, as people deserving of their kindness. Talk to with your child about respecting the feelings of others as well to make sure they understand what bullying is in all contexts. Cyber bullying is an unfortunate part of reality that more and more kids experience on a regular basis. While younger children may not be as likely to become directly involved in a cyberbullying incident, either as the victim or perpetrator, it is never too early to help them understand how to identify cyberbullying behavior. Additionally, by encouraging a respectful use of technology from the very beginning, you will help your child to use computers and phones responsibly throughout their childhood and adolescence and into adult life. This piece was written by Michelle G Putz. She is a Marriage and Family Therapist. She works with couples or families who are seeking professional help in solving conflicts, improving communication or changing behavior. She works in mental health clinics, social outreach agencies, hospitals, institutions, and private practices. 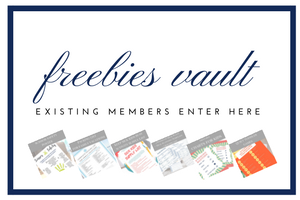 PS – If you enjoyed this piece, you may also like Teach Your Toddler to Be Kind Using This Free Visual Guide.